No, I’m afraid a trip isn’t the giveaway….but I hope you’ll keep reading anyway. Today is the first day of another journey around the sun for me, so I’m sharing one of my favorite Martina McBride songs (with Jimmy Buffett). There have been times in my life when I’ve been an avid reader, but that isn’t the case these days. But this is one of the best books I’ve ever read, and I was truly disappointed when I came to the end. 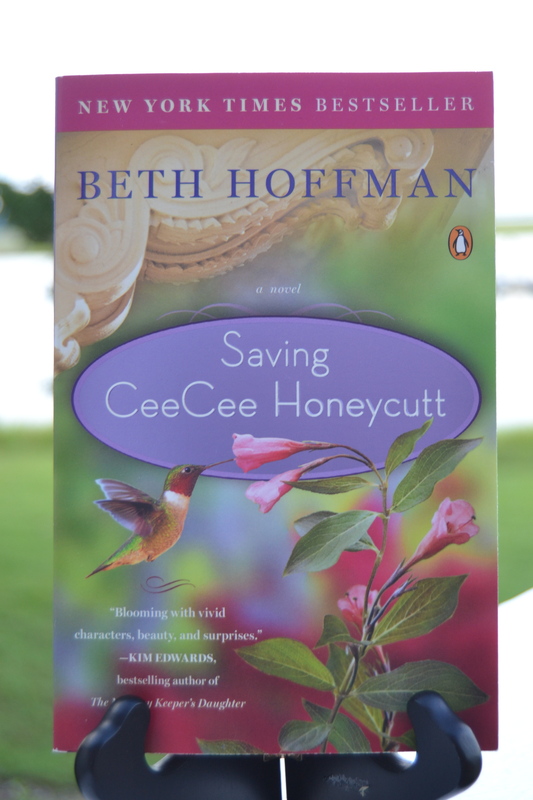 Hopefully Beth Hoffman has more books in the works for those of us who have discovered her wonderful writing. This is what I hope to do: I’m giving away this book, hoping the winner will write a little note in the inside cover (maybe their name, the date and the name of their blog), and then share it in a giveaway of their own. If the winner of my giveaway doesn’t have a blog, we’ll cross that bridge when we get to it. So please leave a comment here on my blog, letting me know if you’d like to be entered in the drawing. And I’ll have either Motor Man, Marshall or Sundae draw the winning name. The winner will be announced on Wednesday. And now, I’m kicking off my next journey around the sun this morning with a birthday breakfast with Motor Man and Marshall. This entry was posted in Family and tagged beth hoffman, birthday, jimmy buffett, martina mcbride, saving cee cee honeycutt, trip around the sun. Bookmark the permalink. Many Happy Birthday wishes to you, Dianna! I love your birthday sentiment and your idea for this book giveaway! May you be showered with love today and always. Enjoy every minute of this special day of yours…you deserve it! Happy Birthday Dianna and may you have MANY, MANY more journeys ahead….including the one to a birthday breakfast with your guys this morning to celebrate! Happy Birthday. See you today for your birthday lunch! HAPPY BIRTHDAY, Sis! Enjoy your b’day breakfast and lunch! What a wonderful way to thinks of birthdays! Me loved the song too! And gifting on your birthday is so cool! Me is here to sings yous the birthday song! Have a very happy birthday neighbor and friend. I know JR will make it special…cause that’s what he does! After I read a book I “pay it forward” and send it to a friend. I’ll put you on my list and maybe you’ll discover more books you love. I hope this years journey for you is filled with happiness! happy birthday to you!!! don’t enter me in the drawing as i don’t read! I love your way of thinking about your birthday! I didn’t realize ours were so close together…hope yours is a wonderful day spent with those you love! And what a lovely idea for a giveaway! A Very Happy Birthday to YOU Dianna. May you see many more 365’s. What a nice way to celebrate your birthday – by giving instead of receiving. I hope your day is fabulous and that we’ll see evidence of cake and joviality in a future blog! Have a FABULOUS birthday!! Hope you have the best day ever!! Another trip around the Sun!! – I enjoyed your Birthday Breakfast !! Make it a great one !! Happy Birthday!!!! Happy Birthday, Dianna!! Your idea of sharing the book is a good one; however, don’t enter me because I seldom have time to read (except blogs, 😉 Hope you have a wonderful day! happy birthday dianna, i hope you have a wonderful day!! your book sharing idea is a beautiful one. i especially like the part of adding a hand written note and paying it forward. i don’t read but i hope the person who wins enjoys the book, adds their message and sends it along!! Happy Birthday, Dianna! Hope your trip around the sun this year is a fantastic one! The book sounds good and that’s a great idea to pass it on. I love reading, when I have time, so I’d be happy to be entered…thanks! Have a beautiful day and have lots of fun!! Happy Birthday! Wishing you a beautiful day and a wonderful year. I’m intrigued by the title of the book and would like to give it a read. happy birthday! I tweeted this, and hope the next hands this book crosses enjoys it as much as we did! Oh Happy Birthday to you – I hope you really enjoyed your day. Happy birthday and we love that 365 quote! We’ve read the book (which we loved) but we only have cat-related giveaways at our blog. Happy Birthday to you! I hope your day was filled with sunshine & joy! I would love the book but it will be fun to read about where it goes regardless 🙂 Hugs!! Happy Birthday!! LOVE the giveaway idea…If I don’t win it this time, maybe I’ll win it when the next blogger passes it on!! Wishing you all the best this year ~ many more beautiful sunrises and sunsets and adventures! Happy Birthday dear friend. The Lord has given you so much so far, I can waite to see what he has in store for you for the next 365 days! Happy Birthday from me and my furbabies! This post was a wonderful surprise, thanks so much for your kind words about my novel. I’m delighted that you enjoyed CeeCee’s story!